Tonight Vala revisits her old digs and then gets sent far, far away. At the SGC Vala gets the team to go on a mission off-world to a former Goa’uld occupied world that has been visited by a Prior. After sneaking onto the planet Vala reveals to them that the people of the planet still believe her to be Qetesh, the former personality of the Goa’uld who used her as a host, and that Vala uses the planet for resources and as a useful hideaway. After being subjected to a terrible AmDram production the rest of the team decide that they’re going to inform the villagers of the truth of the situation and hopefully convince the village of the truth of the Prior. The team comes across problems with the Prior situation even before revealing the truth of Vala, with the Prior having already healed a seriously sick man causing a split in the village between those who believe in Qetesh and those who believe in the Ori. While Vala believes she could order the village to ignore the Prior Daniel instead decides they must make a choice using facts and the truth which ends up seeing Vala thrown in jail and sentenced to death. Thankfully for the thief however the village agree to a trial using the system that Vala instituted (and named after herself) that will see her be publicly judged for her crimes. At the trial SG-1 are able to get many of the charges nullified against Vala as they pertain to when she was held by the Goa’uld Qetesh but unfortunately leaves a raft of charges relating to her continued use of the Qetesh persona. As Daniel attempts to clear Vala of the charges the Prior returns, revealed to be the man who had Vala and Daniel burnt at the stake, and once again begins to proselytise belief in the Ori to the villagers. Daniel attempts to counter his claims of the Ori’s worthiness as gods using scientific explanations, with the village ending up split again between the religious versus science debate. After Daniel’s explanations the Prior seems to peacefully leave allowing the court to continue deliberating, who come to the decision of life imprisonment. The resulting argument is cut short however when reports of villagers falling ill, including the man who the Prior previously cured, reach the team. Daniel attempts to use this as an opportunity to free Vala while also saving the villagers by having Vala heal them with the Goa’uld Hand Device, with the team seeming to have succeeded on both counts. Despite the initial success of the healing device more and more of the village begins to fall sick, and those initially healed also begin to see the illness re-emerge. Vala finds herself growing increasingly despondent as both herself and the SGC medical team who come to help fail time and time again in treating those infected (which now includes Mitchell), with only Daniel able to provide some emotional support. Eventually all delaying measures fail and villagers begin to die, at which point the Prior returns to offer the village once whom the villagers pledge themselves to in desperation for a cure which he gladly provides. In the aftermath the villagers find themselves enslaved once more, with the Prior telling the team to tell others of what had happened before leaving for parts unknown. Here we are with another episode of the show that is heavily focused around Vala and her backstory and what another cracking display it is from both Shanks and Black. For a character who was only meant to be a replacement during Tapping’s pregnancy the show really did put a lot of effort into exploring the character of our Milky Way thief and smuggler. This time we focus on Vala’s time as a host to the Goa’uld Qetesh and the aftermath once it was removed by the Tok’ra. It turns out that despite her claims of being mistreated by the locals she in fact never gave up the job of ruler, maintaining the ruse of being their ruler. Her rulership in many ways is similar to that of Maybourne in It’s Good To Be King, with her on the surface entirely selfish answers actually containing a good deal of more altruistic aspects such as Vala’s introduction of a fair trial and the fact she didn’t actively mistreat them either. It’s a humanising touch that stops the character from straying into good goody territory while also avoiding making her hard to relate to or care for. Towards the end of the episode you also see true compassion towards her people as she fails to heal them, accepting responsibility for their suffering and having nothing but despair at the fact she can’t help them. On the flipside we have the Prior who displays true evil and cruelty in the episode. Despite coming in to preach the altruism of his gods they willingly infect the entire settlement with a deadly virus that has no cure and happily watch the population die even though he has the power to stop their suffering until they accept the dominion of the Ori as their gods. Even the Goa’uld, who used their armies as fodder and human populations as slaves, generally understood there was more value in keeping them alive and healthy to work as opposed to deliberately weakening and killing them. The setup also adds further to the hypocrisy of the devout followers of the Ori who see no problem with killing despite preaching that they care about the flock, with the Prior ignoring the villagers who already worship them as he commands while they ask for his help. The episode also takes time to further the Daniel/Vala relationship too. Up until now the two have had this casual relationship where Vala deliberately tries to drive Daniel up the wall to get a reaction while he enjoys seeing her get her comeuppance to a certain degree and at the start of the episode this continues pretty much the same way. At around the midpoint though you begin to see this shift towards Daniel trying to comfort her as she struggles with her role in what is happening, hinting that he does care for her as a friend more so than he’s willing to admit. In conclusion it’s another great Vala-centric episode that shows a much deeper character than she appears to be while also continuing the post-Goa’uld and Ori arcs. · Only play worse than this is the depiction of Romeo and Juliet in Hot Fuzz. · I like how this links the plague that killed the Ancients the first time round to the Ori. · Unrelated to the episode but on the DVD that contains this episode there’s a Behind the Scenes featurette about the props of the show and a series of fun shots where the camera guy desperately tries to avoid getting a very risqué calendar in the back of shot. On a Jaffa planet somewhere in the Milky Way a group of natives confront a Prior who has come through the Gate. After the Prior refuses to leave the Jaffa open fire on him, only to have no effect and the Jaffa to go blasting off again. After dealing with the Jaffa the Prior begins creating a shield around the active Gate. Soon after the SGC receives a message from a Goa’uld called Nerus who wishes to work for the SGC given that they defeated the Goa’uld and Replicators. Despite Vala’s warning about bringing him to the SGC Landry decides to hear what he has to say which it turns out is a warning of his own, that the Ori are attempting to establish a beachhead in the Milky Way through which they can deploy their armies. Given the situation Landry has Carter return to the fold to help with the deployment of a new bomb, the Mark IX, and help deal with the technical challenge regarding the forcefield. Using the Prometheus the team head for the beachhead planet, finding that the shield has already expanded significantly around the Gate. Given that their only option is to use the new Mark IX “Gatebuster” nuclear weapon the team head down to offer the Prior one last chance of stopping but the man refuses, still devout in his belief of the Ori. As the team awkwardly stands around, having given the Prior 30 minutes to leave, the Free Jaffa finally shows up with Ha’tak vessels which begin immediately firing on the shield, forcing the team to withdraw. When the ships finally respond to Prometheus’s hails it’s revealed that the group of ships are under the command of Gerak, the militaristic leader of the Free Jaffa, who questions the SGC’s resolve. When the “Gatebuster” finally goes off the only effect is the continued expansion of the shield around the planet. Given the failure of the bomb both the Prometheus and Ha’tak vessels begin firing on the shield only for Carter to realise that, just as Vala foresaw, the entire venture was an Ori trick, with the shield being powered solely by the weapons fire used by their opponents. By this point however it’s too late and the shield has fully formed, with objects now being launched through the Gate to form a giant Supergate above the planet. On Earth Landry confronts Nerus who gladly admits he’s helping the Ori. Back at the beachhead the planet itself begins to collapse, likely to form a black hole to power the Gate from this end. Vala tries to offer a suggestion but the others speak other her so she decides to act anyway, using the ship’s rings to hijack Gerak’s cloaked tel’tak and ram it into the final space in the Supergate, successfully destroying the Gate when the planet singularity is formed. Vala however doesn’t appear to make it back to the ship but thankfully Daniel doesn’t suffer any longterm consequences, showing that the link between the two had finally broken. Back on Earth Landry decides to put Nerus to work in Area 51, using hunger as a motivation, while on the ship the team theorise that Vala may have been sent to the Ori galaxy and is therefore still alive somewhere. And here we are at the end of the Mal Doran saga for season 9, with Carter finally making her return to the base from Area 51, and the Ori making their first military moves of the coming war. The story largely follows the title of the episode, with the Ori trying to establish a foothold within the Milky Way to launch their armies from. While the team initially believe that this is simply keeping a Stargate active and protecting the planet it turns out that instead they use the SGCs weapons against them, instead using the planet’s destruction to power a much larger Gate that would allow entire ships to come through at will. The story adds a new aspect to the Ori we haven’t come across yet as up until now they’ve acted fairly obvious in their intentions. 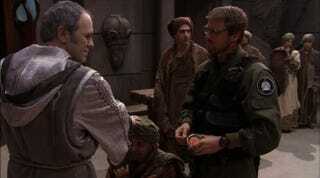 Here however their entirely plan relies on quite complicated double-dealings and double agents in place long before the Prior even arrives to start the final process, with the Ori having gotten a Goa’uld on their side first to then feed false info to the SGC that they use to reach the wrong conclusion. It makes a change from the whole “religious nutter” angle going so far and also puts the SGC in a bad position due to their own actions for a change, with them ignoring Vala’s advice largely due to their underestimating of the threat Goa’uld can still pose and the strategic thinking capabilities of the Ori. Talking about Vala the episode once more sees her the focus on the SGC side of things, with the criminal being shown to be in the right time and time again. Not only does she use her previous knowledge of the Goa’uld to predict that Nerus has an ulterior motive but she is also the only one who could come up with a solution to the issue of the Supergate when all others had failed, using the Ori’s own plan against them as the Ori had tried to do against the SGC. It’s a shame however that this means she disappears for most of the season now as Vala has already been turned into a very central character compared to others right now. In the end the show is now returning to its more standard setting, with Carter making a rather underwhelming return to the show (very soon after Tappings maternity leave) which limits both her role in the show and removes her replacement for no good reason. Next week, we get probably the most racist episode since Emancipation all the way back at the start of season 1. · I like how Nerus just casually reveals that the Goa’uld can talk normally but choose to sound like villains for the intimidation factor. · God that Prometheus model has not aged well.